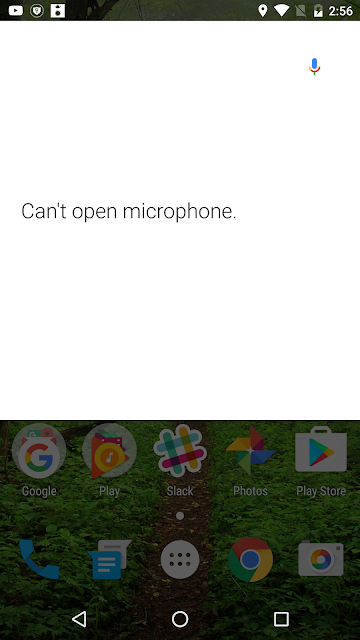 Recently, with advanced permission management options in Android Marshmallow, users are seeing errors that says “Can’t open microphone” when an app tries to access the mic. This error comes up basically due to an app not being able to access the phone’s mic because it doesn’t have the necessary permissions for it. This issue has been reported by users who try to use the Google Now app along with the Ok Google voice command. They see an error as shown in the screenshot above. The way to fix the “Can’t open microphone” error is to dig into the App permissions of the application that shows the error. There you can turn on the Microphone permission by dragging the slider to the right. Go to Android Marshmallow’s main Settings. Find the app for which the error is displayed. If it is Google Now then tap on Google App. In the App info page, tap on Permissions. Under App permissions, drag the slider of Microphone towards the right by tapping on it. Now you will be able to use the microphone without facing any issues provided that the hardware itself doesn’t have any problems. Also, the steps above are for turning on the microphone permission for the Google Now app. You will have to tap on a different app in the list of applications if you are trying to fix it for something else. The rest of the steps are the same.